The Hebrew Israelite are nomadic Arab tribe, (Hebrew=Ebri=Arbi=Arab). The homeland of the Hebrew Israelite is Yemen and Asir (now in Saudi Arabia). The Hebrew Israelite took fled drought and disturbances in Yemen to Ethiopia. The Hebrew Israelite never went to Egypt at any time. The Hebrew Israelite refuge in Ethiopia lasted 430 years (1876 -1446 BC). The Hebrew Israelite harmed the Ethiopians although they were well received and treated. Many Hebrew Israelites went into the Sudan and other parts of East and Central Africa. The Hebrew Israelite raided, looted, and enslaved many nations in Africa. The actions of the Hebrew Israelite destroyed many African tribes and states. Moses fled Ethiopia to the Sudan and was involved in power and military struggles. Moses married a Nubian Sudanese daughter of Shua’ib the priest of Midian. Midian and the holy tree are in the Sudan, where God first spoke to Moses. Ethiopian kings ordered the expulsion of The Hebrew Israelite and welcomed their departure. Ethiopian kings refused to allow The Hebrew Israelite to take the illegal wealth they made. The Hebrew Israelite fled Ethiopia secretly to keep their illegal wealth which was banned. The Exodus was in 1446 BC by crossing the Red Sea at Bab El-Mandeb. The Hebrew Israelite returned to their homeland in Yemen and avoided contacts with Arabs. Mount Sinai (the mount of Moon/ or beauty) is in Yemen and not east of Egypt. Moses received the Ten Commandments and the original 5 books in Yemen. The Promised Land for the Hebrew Israelite is only for the faithful Israelite. Immediately the death of Moses the Hebrew Israelite forged the 5 Books of Moses. The Hebrew Israelite rejected their home land and claimed that the Promised Land is Canaan. The Hebrew Israelite started a long journey passing by the Mecca towards Canaan to invade it. The Hebrew Israelite raided then conquered the Canaanite in 1400 BC after long disturbances. The Arab Hebrew Israelite were never called “Jews” during their first settlements in Canaan. The Hebrew Israelite created 12 separate tribal settlements in occupied Canaan. The Hebrew Israelite plunged into bloody tribal wars that ended with the supremacy of Judah. The rule of Judah over all the Hebrew Israelite ended by another civil war resulting in two states. Nomadic Turkic Mongolian bands went into raiding Iran, Mesopotamia, Caucasus, and Anatolia. Pagan Turkic Mongolians were practicing a cult called Tengeri (Sky, Moon, and Star). The Turkic Mongolians conquered the Iranians and created the first Persian state over Iran. The Turkic Mongolians took away Babylonia from the Assyrian Empire, then invaded Assyria. The Turkic Mongolians invaded Canaan in 605 BC which was under Hebrew Israelite occupation. After failing to pay tributes the Turkic Mongolians arrested the rulers of Hebrew Israelite. The captured rulers of Hebrew Israelite were few hundred and were deported to Babylonia. All the Israelites remained in Canaan and were forced to pay tributes to Turkic Persians. Massive Israelite Captivity to Babylonia never took place, other than for few hundreds in 585 BC. The Turkic Persians designed a plan to take over occupied Canaan without military occupation. The Turkic Persians invented a political policy and called it “Judaism” as a religious take over. Starting from 535 BC the Persians sent many hundreds of thousands of settlers to Canaan. The new Turkic settlers claimed that they are the legitimate descendants of the Israelite rulers. The new Turkic settlers sent to Canaan created new ethnic group which was named “the Jews”. The Jews are not the Judeans, or from the Hebrew Israelite, nor of any Semitic origin. The Turkic Jews started ruling the occupied Canaan since 530 BC with supports from Persians. The Turkic Jews created massive demographic changes among the Israelites in occupied Canaan. The marriages between Israelites and Canaanites were nulled to allow Turkic Jews to marry. Ten Israelite tribes were persecuted and deported to other lands, which made them Lost Tribes. Turkic Jews exchanged and brought settlers from the Mediterranean creating the Palestinians. Pagan Turkic Khazars received groups from other Turkic colonies in 660 AD to turn to Judaism. The Hebrew Israelite are totally different from the newly invented Jews. The Jews are not Semite at all but they are of Turkic Mongolian origin. 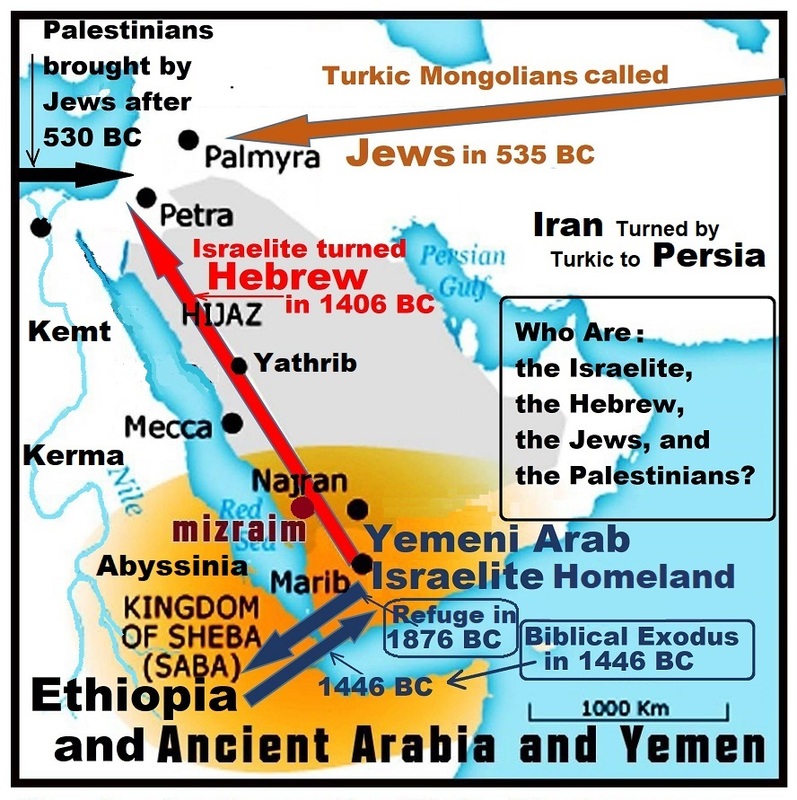 The Yemen is the homeland of Hebrew Israelite. Ethiopia has considerable original Hebrew Israelite population than the State of Israel. The Israelite presence, slavery, and Exodus from Egypt never existed. The present day Torah and Old Testament were forged to legitimize the invasion of Canaan. Anti-Semitism is a hoax invented by Turkic Jews who falsely claim to be Semite. Canaan is not a holy land to the Jews, nor a Promised Land to the Hebrew Israelite. Canaan is not homeland to Palestinians, who came from Crete and the rest of Mediterranean. The Arab-Israeli conflict is an illegitimate case deliberately manufactured. The Israelite were Arab tribe in Yemen speaking Old Arabic language and were writing in Ancient South Arabian script called “Musnad”, which became extinct, now it only survives as Ge’ez in Ethiopia and Eritrea. The Israelite were not called Hebrew (Ebri) before they invaded Canaan in 1400 BC, they were still Arbi. Only after they colonized and intermarried with Canaanite (which was allowed before the Turkic Jews cancelled them with new codes in 530 BC) they called themselves Ebri (Hebrew) and wrote their Arabic language with scripts derived from Phoenician scripts. The oldest found Hebrew inscriptions date to 1000 BC only. The Paleo-Hebrew alphabet also spelt Palaeo-Hebrew alphabet, is only a variant of the Phoenician alphabet. Their Arabic language itself borrowed heavily from Canaanites then they called the new product Ancient Hebrew and its scripts continued to develop. The extinction of the Ancient South Arabian script “Musnad” was deliberate act from Jews who influenced the Arabs to write the Holy Quran in a newly developed script borrowed from Nabataean language from North Arabia, and the Arabs ignored the ancient and well developed and widely used script of Musnad. The History of the Hebrew language is another well-kept secret and shrouded with myths. The world must start discovering the true history of Israel and of humanity, and correct all misuses and abuses. The Jewish people and Jewish State and Jewish religion are inventions, forged out of lies, myths and fictitious “history” to justify Jewish ownership of the land of Canaan and to manipulate and destroy all nations, especially Europeans to manipulate and destroy other nations. This is just one foundation for global revolution against mainstream academia, politics, religions, and media. A call to awake and aware the people all over. Everybody has a role to play in this coming global movement, which can save the world from further bloodshed. If the above is true, this is revolutionary in its importance. Many Protestant Christians, who take everything in the Christian Bible as literal truth, will choose to reject this thesis and remain in a state of denial. The word “fake” is being used so often these days – even the US President, Trump, uses this term to describe our news media in the US. The terms false and fraudulent could be used in place of fake to describe the historical narrative we have been given about the “Jews”. What passes for history is often just propaganda and is often not in accord with the facts. Thus, there is a need for revisionist historical research to obtain the truth, to obtain the facts. This is just one foundation for global revolution against mainstream academia, politics, religions, and media. A call to awake and aware the people all over. Everybody has a role to play in this coming global movement, which can save the world from further bloodshed. There is fake history and there is forbidden history. We only present the reality of the dilemma here. But, we encourage readers to do their own research so that they can reach informed conclusions for themselves. What if the people we know as “Jews” are imposters? Would that not mean that these people are not “the apple of God’s eye”? And, would Christian Zionism be seen for the sham that it is? Check out this post from another blogger. Very good informative article, thank you. I don’t know but I suspect you are setting in motion a sort of revolution along the lines good guys versus bad guys. It looks as if you have picked upon the Jews as particularly repulsive compared to other enlightened human beings . It’s not a theory that holds water we are all homo sapiens from the same ancestry . About 100,000 years ago we came out of Africa along with other humanoid species with whom we interbred , we all contain Neanderthal DNA.. The history of the human race is one of bloodshed and struggle in the battle of existence and it has not stopped. The great pyramid of wealth has always been with us with the elite at the top and the weak destitute at the bottom. All my articles are about discovery true history and not about political correctness. People must find truth, justice, and freedom. Yes it is a revolution, but you don’t have to worry from changing to the better. There is no need to assume I am targeting the Jews unfairly when I explain the facts that they are not Semite, and not a religion, ethnic group, or a nation. Truly, the Jews are only members of a political association that is serving the Turkic expansion policies and criminal acts; and Judaism is just the earlier form of Zionism. These are fair, unbiased, real facts. You didn’t tell who are the good guys! For example, “Dreamers” is a term describing behavior, it doesn’t have any religious, ethnic, or national connotation. The term “Jews” or “Zionists” are exactly the same.